MIAMI, Florida (CNN) -- The National Hurricane Center is no longer including storm surges and flooding in its hurricane categories out of concern that people aren't heeding proper warnings, because the surges haven't always matched the levels predicted in each category. Officials are worried that Texans did not heed storm surge warnings for Hurricane Ike last year. When Hurricane Ike slammed into the Texas coast last year with Category 2 winds (96-110 mph), it had a storm surge of 15 to 20 feet. That's a level more in line with the scale's description of a Category 5 storm, which has winds greater than 155 mph. A Category 2 hurricane, the Saffir-Simpson scale said, was likely to bring a storm surge of only 6 to 8 feet. 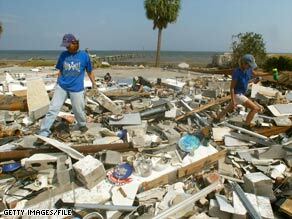 Ike was the third most destructive storm ever to make landfall in the United States. It was responsible for at least nine deaths, eight of which were in Texas. According to CNN's Sean Morris, forecasters and emergency management officials feared that many residents of South Texas did not heed the warning of an anticipated severe storm surge because Ike was listed as only a Category 2 storm. Storm surge and flooding, not winds, almost always cause more deaths in a hurricane or tropical cyclone, he said. Hurricane specialist Richard Pasch said the Saffir-Simpson Hurricane Scale, to be renamed the Saffir-Simpson Hurricane Wind Scale, was set up in the early 1970s to measure the intensities of maximum sustained winds in hurricanes. Factors such as surges were added later. Storm surges, Pasch said, are affected by a number of variables in addition to winds, including the shape of a coastline, water depth near the coastline, and storm size and structure. All those factors are separate from the Saffir-Simpson scale. Storm surges and flooding information will continue to be included in National Weather Service advisories. The public can comment on the change at www.nhc.noaa.gov/aboutsshs.shtml. If comments are generally positive, the change will be made permanent. The National Hurricane Center, based in Miami, Florida, has a unit that does storm surge modeling and predictions. The Pacific hurricane season began Friday, and the Atlantic season starts June 1. Both seasons end November 30.